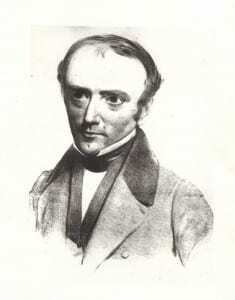 Robert Grant (1793-1874), one of UCL’s founding professors, established the Museum in 1828 as a resource for students taking his Zoology and Comparative Anatomy lectures. 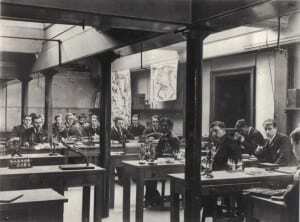 Many of these students would have been medics as comparative anatomy was seen as a crucial element of medical theory. He was a radical and a transmutationist. Grant taught about the origin of life and relations between animals, using ideas of evolution long before Darwin’s (1859) Origin of Species. Owing to Grant, this Museum was the first place evolution was taught at an English university. In the 1800s, museums sought “one of everything” in Nature’s catalogue. Exotic, obscure specimens were prized. The Grant Museum today covers the whole of the animal kingdom from across the globe. Diversity was the goal. In our archives we have a catalogue of labels printed by E. Ray Lankester – one of Grant’s successors. It’s a bit of a frustrating document as Lankester included specimens he wanted to have, as well as things that were actually in the collection, with no way of distinguishing between the two. Species are assigned to taxonomic groups by their possession of shared derived features. Grant and Lankester’s students – like students at UCL today – were taught the characteristics of each group, and their relationships, using museum specimens. In London, Grant led the field of comparative anatomy, where relationships are based on structural similarities and differences between species. He was the first in England to teach it using both fossil and modern organisms. Comparative anatomists investigate whether structures are similar because they arose in a common ancestor (are homologous) or because they independently evolved to do the same job (are analogous). An example of analogy is eyes with lenses, many of which are displayed in the new cases. Eyes with lenses have evolved independently in at least six phyla (that is, the largest grouping within the animal kingdom) – in the vertebrates, box jellyfish, snails, velvet worms, bristle worms and squids and octopuses. These structures appear similar, but are not descended from a common ancestor. The idea of something that doesn’t really have a brain, like a jellyfish, having complex eyes is a bit of a wonder. The improbability of the evolution of the eye is something that creationists often try to use as evidence for their arguments. The very fact that it has happened independently in these six groups just shows how weak that argument is. Vertebrate limbs are an example of homologous structures – they differ because they have evolved to perform different functions like swimming, flying, climbing and walking. Under the surface, however, they share a unifying structure which was present in their common ancestor. They all have a humerus, radius, ulna (or femur, tibia and fibula) and then modify their digits depending on the task. Whales, dolphins and dugongs, which don’t have hind limbs, still have homologous pelvises just floating in their soft tissue, because they evolved from animals that did have limbs. I can think of few better visible proofs of evolution. The new displays showcase some stunning, if rather strange, series of wax models showing the stages of development of various animal groups. They were made by the famous Ziegler studio in Germany in the mid-1800s and were indispensable tools for teaching and research. They helped to train students for detailed microscope work on comparative embryology. This was studied for insights into evolution, as developing embryos were thought to grow by first expressing stages of the evolutionary history of their species. Today they are still used heavily in teaching, but now they support History of Science classes. The specimens we’ve selected show some stunning examples of a great time for whole animal zoology; a period that was really crucial to the development of the Museum’s collection, and for biology at UCL. Things were about to change after the Second World War – I’ll return to that in a future post.